I've been hungrily eye-ing these Peter Jensen lace up-maryjane-boots of awesomeness on the Topshop website for a couple of weeks now. They are ridiculous and I love and need them. 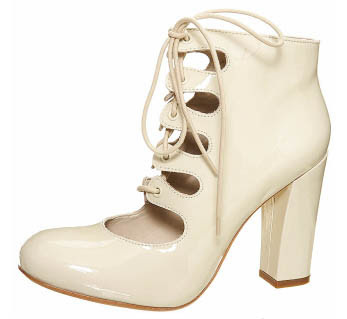 They are also 200 bucks, which I'm a little weary to pay for something from Topshop. It's weird because people have always said that Topshop is like a nicer H&M but the truth is that it's so much more expensive that now I can't necessarily correlate their prices with their "just like H&M" comparison that has been thrown all over the place. I really love them though and they're 100% leather which is totally rad. But I just don't know. Wah wah money. Oh wellz. yea, you know i love these because they remind me of those chloe jawns. so awes. oh dudes, yea thats totally part of the appeal. Hey!!!! I digg ur blog to the max. Always checkin for updates and I kno ur always lookin for some cool new blogs to check out. So check out mine... Its fantasyaction.blogspot.com. Enjoy!! Let me know what u think of my "poems"
The thing is, I think these are fabulous. On you. On me, I think they would look hilarious. i need to get them, right? because if i dont get them then its ANOTHER 7 years bad luck? they're the catwalk shoes? i didnt know that! in that case, I am placing an order tomorrow.